Spaying refers to the surgical procedure performed on female dogs and cats to render them infertile. There are many benefits to spaying your female companion. First, you will contribute to the prevention of the dog and cat overpopulation. Second, spaying will eliminate the sometimes ‘messy’ heat cycles that attract male dogs to your house from miles away. Third, you will help prevent diseases in your pet such as pyometra (infection in the uterus) and mammary cancer. 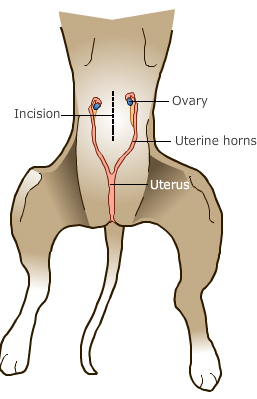 Spaying involves surgical removal of both ovaries and the uterus. It can be performed under a number of anesthetics and monitoring devices. If you are shopping around for a competitive price on this procedure, be sure to question the type of anesthetic used and the monitoring equipment and procedures followed. There are several monitoring devices that can be used during your pet’s anesthetic. A technician continually assesses your pet’s vital signs during the procedure. Although the risk of an anesthetic death in a normal healthy pet is very rare, monitoring devices and procedures allow a response to an anesthetic emergency faster. Faster responses can save lives. Please call or visit our facility to learn more about our spaying procedures.